Beginning in July 2016 Piwik PRO has extended its existing web analytics platform with an integrated tag management system. Piwik PRO Tag Manager comes with built-in integrations for Piwik and a range of other marketing & web analytics tag templates. 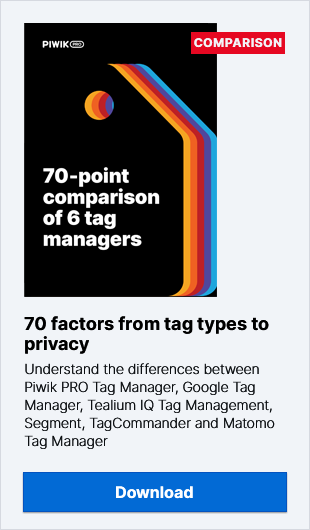 In keeping with the PRO Team’s commitment to data privacy, Piwik PRO Tag Manager provides marketers and web analysts with a security-friendly, self-hosted alternative to corresponding Google products. What makes Piwik PRO Tag Manager Different? According to the W3Tech Report, 5.7% of all websites use tag managers. Nonetheless, the TMS market is becoming competitive. Piwik PRO Tag Manager stands out from other tools by addressing data security needs with self-hosting. It supports both synchronous and asynchronous tags. Users can add Opt-Out and Do Not Track features in every container with one click. This helps to make every tag privacy-compliant, even in case of 3rd-party ones. Piwik PRO Tag Manager fully integrates with Piwik analytics, making it ideal for users who require full data privacy. With built-in Piwik tag templates users can easily enrich their reports with data that would otherwise require accessing the website source code to collect. Piwik PRO Tag Manager lends itself to the implementation of a variety of processes, including event and content tracking, custom dimensions and variables, as well as virtual page views and cross-domain tracking. Piwik PRO Tag Manager also makes it easy to implement popular marketing and analytics tools. These include: A/B tests platforms (e.g. Optimizely and VWO), web analytics tools (Google Analytics, CrazyEgg, ClickTale, etc. ), UX and CRO applications (intent-triggered pop-ups or feedback widgets like Qualaroo) as well tracking and remarketing pixels (Google AdWords, Facebook). For more complex needs, users can add custom synchronous or asynchronous HTML tags along with custom triggers and conditions. For more information, check out the Piwik PRO Tag Manager product page or the Piwik PRO Tag Manager Guides.